Archaeologists estimate that Homo sapiens (modern humans) have been on the Earth for some 200,000 years. That’s just a fraction of the age of the Earth, which is some 4.54 billion years old. The first humans evolved (“Homo“) from australopithecine ancestors about 2 million years ago. This time frame makes ants far, far older than humanity. Scientists estimate that ants came about in the mid-Cretaceous period, which was an amazing 110 to 130 million years ago. Accordingly, humans are the babies on planet Earth. 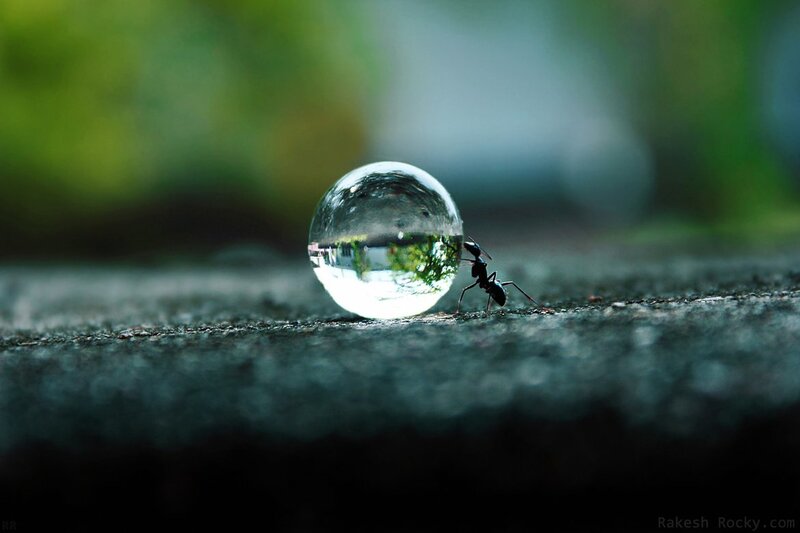 Ants are quite the travelers. They are found nearly everywhere on Earth, with the exception of Antarctica and the Arctic (there are also a few islands that seem to be free of ants). There is one species of ant, the Argentine ant, known as Linepithema humilespecies, that has invaded 6 continents. Within the last century, these little critters have established themselves in at least 15 countries throughout the world, and they don’t seem to be stopping their conquest. The hives are literally swarming across the planet. The largest ant ever discovered is (fortunately) not alive today. Rather, it is a fossilized specimen that belongs to Titanomyrma giganteum, and it was truly a beast of an ant. have you ever accidentally walked through an ant colony and looked down to find a plethora of ants stalking about on your foot? Well, imagine having a bunch of superlarge, mutant ants walking up your leg! Okay, so the ants in the fossil weren’t mutants, but they kind of looked a bit like it. This fossil reveals that T. giganteum was about 2.4 inches (6 cm) long, and it seems that it had a wingspan of nearly six inches(!). For comparison, the average size of the current ant species is a mere .08 to 1 inches (.2 to 2.5 cm). Ants can come together to form an enormous, coordinated “superorganism.” Just as humans are able to function because of all of the various organs that comprise our bodies, so do individual ants function as parts of a larger organism. There are a number of individual parts (ants) that fit together to cooperate and accomplish amazing feats. Rather than working as individuals, they function as parts of a collective whole, doing what is best for the colony as a collective. For example, a swarm of ants work together to select the ideal location for the hive, whereas a single ant may make a mistake. Ants are able to do this because of the way that they communicate (more on that later). They “talk” in such a way that they form a seamless, brain-like structure. In this respect, individual members of an ant colony are able to “talk” with each other in order to coordinate their efforts by using their antenna to smell the chemicals that other ants release. As it turns out, this is a rather rapid and effective form of communication. There are a lot of ants on Earth. A lot. Although they may be small, they add up quite a but. Entomologist Ted R. Schultz noted in an article in the Proceedings of the National Academy of Sciences that ants “monopolize 15—20% of the terrestrial animal biomass, and in tropical regions where ants are especially abundant, they monopolize 25% or more.” However, it must be noted that ants are a taxonomic Family that is made up of some 20,000 known species, which ultimately means that we can’t actually say that they have the largest biomass of any individual species on Earth. Ants may seem like simple creatures, but they actually have rather evolved and complex societies (with an ant queen and all). There are several ant species that raid neighboring colonies in order to steal eggs or larvae to bring back to their own colonies. This is a practice that is known as “dulosis.” Of course, these forcibly acquired young are not always turned into slaves. Sometimes they are used as a food source (they are eaten). The species that use dulosis are informally called “slave-making ants,” and many of the ant species that use this practice do so in order to support their colonies. Ants, like most small insects, are rather powerful. They are able to lift 3 times their body weight, and they can dangle while holding some 100 times their own weight. This is rather impressive, but they aren’t the strongest critters around. The dung beetle is the strongest known insect, as they are able to lift a staggering 1000 times their own weight. Compared to a human, ants are only on this planet for a brief time. Many species only live for a few weeks. However, some ants can live for years. In fact, many queen ants can live for decades (the oldest recorded ant lived for an astounding 30 years! ).